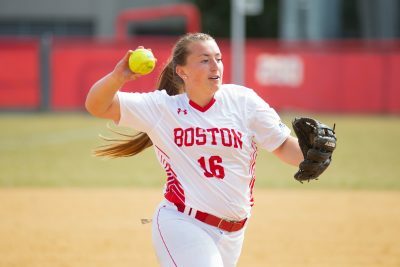 The Boston University softball team won a weekend series at conference foe Lehigh University Saturday and Sunday, besting the Mountain Hawks in two out of three games down in Bethlehem, Pennsylvania. After the series win, the Terriers move to 20-16 overall and 5-1 in the Patriot League. The Mountain Hawks dropped to 12-21 overall, 4-5 in conference play. BU coach Ashley Waters said she was happy with her team’s performance over the weekend in the two winning games. The Terriers opened the series with a sweep of Saturday’s doubleheader against the Mountain Hawks. Sophomore pitcher Ali DuBois (14-6) took the mound for the Terriers and twirled a gem as she earned a complete-game shutout while surrendering only three hits to Lehigh. The Terriers had opportunities to score throughout the game — BU left 11 runners on base — but the score was deadlocked at 0-0 until the eighth inning. With the bases loaded, sophomore infielder Marina Sylvestri and freshman infielder Nicole Amodio took one for the team and were hit by pitches, which drove in the two winning runs. Freshman pitcher Emily Gant (5-7) took the mound in her first conference road game appearance for the Terriers in game two and followed DuBois’ near-perfect performance with one of her own. Gant struck out eight Mountain Hawks in just over six innings of work while surrendering five hits. In the bottom of the seventh, Lehigh strung together two singles and Waters made a change, bringing in DuBois to close out the game. DuBois earned her first career save after getting a force out at third and then forcing a bases-loaded ground out to third base. Waters said the duo of DuBois and Gant is a force. DuBois was back pitching for the Terriers in the series finale facing Lehigh’s Parker Boyd (7-8). Sunday’s matinee was a pitcher’s duel with DuBois coming out the hard-luck loser, as she allowed only one run and three hits in her six innings of work. Boyd allowed a single hit all day — to the first batter she faced — and then went on to shut out BU and stop the Terriers’ win streak at seven games. Freshman outfielder Aliyah Huerta-Leipner led the game off with the Terriers’ only hit of the day and then advanced to second base on a sacrifice bunt, but was stranded there after two fly outs. In the top of the second, Gant and senior utility player Analisa Ruff were issued back-to-back free passes to first by Boyd, but the Mountain Hawk pitcher was able to work around the walks and get the third out. In the bottom half of the second, DuBois found herself in some trouble after allowing a one-out single and then a throwing error to put runners at first and second. Lehigh scored its first run of the weekend when infielder/utility player Lexi van Ooyen blooped a single to left field, scoring the runner from second base. DuBois retired the following batter to end the threat. DuBois completed a one-two-three third inning and allowed a base hit in the bottom of the fourth. Boyd continued to roll through both the third and fourth innings, including a one-two-three top of the fourth. Boyd and DuBois traded quick innings in the fifth, as DuBois struck out the side. Senior catcher Alex Heinen walked with two outs in the top of the sixth inning and was pinch-ran for by sophomore outfielder Jen Horita. Lehigh’s third baseman then failed to knock down a hard-hit ground ball and Horita advanced to third base. Boyd escaped the jam off a hard-hit line out directly to the Mountain Hawks’ second baseman. The Terriers came up for their final chance to tie the game with Lehigh still leading 1-0. Boyd closed out the game with a one-two-three seventh inning completing the one-hit shutout. 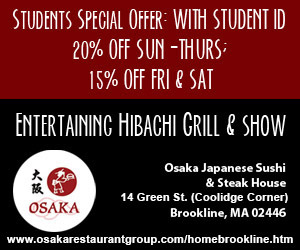 The Terriers will take on neighboring Harvard University away on Tuesday. The team will then return to conference play against Colgate University Saturday and Sunday at the BU Softball Field. Waters said offensive preparation was important heading into the Terriers’ upcoming games, adding the team will work on improving its mindset.